Context: BRAF mutations lead to constitutive activation of downstream signaling in the Mitogen-activated protein (MAP) kinase pathway, and can serve as a molecular therapeutic target for BRAF inhibitors in melanoma. However, there is a scant data on BRAF mutations in angiosarcoma and its response to BRAF inhibitor treatment. The aim of this study was to evaluate for BRAF mutation in metastatic angiosarcoma and its response to BRAF inhibitor treatment. Methods and results: We retrospectively identified cases of hepatic metastatic angiosarcoma in the departmental archives from 2006 to 2015. Total six cases of metastatic angiosarcoma to the liver were retrieved. Histologically, all tumors were high-grade except one that was low-grade. Four of six were epithelioid type and two were mixed epithelioid and spindle cell types. 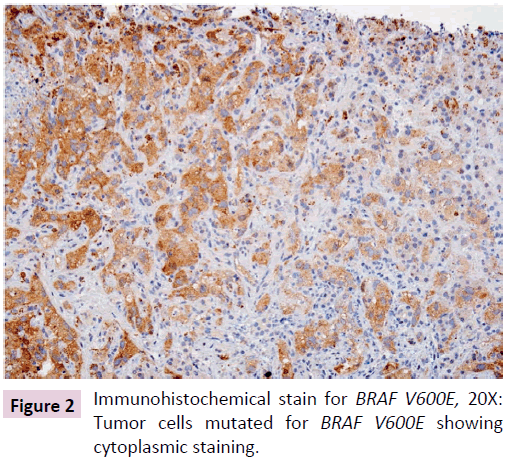 Immunohistochemical (IHC) stain for BRAF V600E mutation was performed which showed one case positive for BRAF V600E mutation. For the positive case, targeted gene sequencing (total 50-gene panel including BRAF) was followed which confirmed BRAF V600E (c.1799T>A) mutation. The patient with BRAF mutated angiosarcoma received Vemurafenib, a BRAF inhibitor, for treatment and showed a significant response to therapy. Conclusion: BRAF V600E mutations can occur in a subset of metastatic angiosarcoma to the liver, and can serve as a molecular target for treatment with a BRAF inhibitor. Angiosarcoma is a rare aggressive malignancy, accounting for 2-3% of adult soft tissue sarcomas, and resulting in a high mortality with approximately 50% of patients dying within the first year. The most common locations for primary angiosarcoma are the breast, skin, deep tissue, and the liver. The liver is also a common site for metastasis. Surgery, chemotherapy and/or radiation therapy, or combinations are therapeutic options, but these treatment modalities are ineffective. Recently, molecular targeted therapy has shed light on the treatment of many previously poorly responding tumors. Recent advancements in genomic research of angiosarcoma have revealed potential therapeutic genetic marker(s). Mutations in the Mitogen-activated protein (MAP) kinase pathway are an important pathway in the development of angiosarcoma . MAPs are protein kinases which regulate cell functions including proliferation, gene expression, differentiation, mitosis, cell survival, and apoptosis . BRAF is a member of MAP kinase pathway and its mutations can lead to constitutive activation of downstream signaling in the MAP kinase pathway, resulting in increase in cell proliferation and survival . BRAF is seen to be mutated in 8% of human cancers [4,5] and accounts for almost 50% of mutations in melanoma . The majority of the mutations in BRAF result in a substitution for valine with glutamic acid at the 600 position of the BRAF protein (BRAF V600E). BRAF inhibitors like Vemurafenib may be helpful in the management of BRAF mutated tumors. Due to potential therapeutic significance, many studies have attempted to identify BRAF mutation in angiosarcoma. Murali et al. did sequencing on 34 angiosarcoma tumor samples and found 4 tumors harboring BRAF amplification and 1 with activating mutation . But so far there is little evidence indicating angiosarcoma harboring BRAF mutation and regarding the response of angiosarcoma to BRAF V600E inhibitor. The aim of this study was to evaluate for BRAF mutation in angiosarcoma and its response to BRAF inhibitor treatment. Index patient: A 40-year-old woman presented to the hospital with complaints of abdominal pain and anemia. The patient was known to have BRCA-1 mutation. The patient also had the history of multiple cancers in the past including papillary thyroid carcinoma status-post thyroidectomy and radioactive iodine therapy (7 years ago), melanoma of left shoulder blade (6 years ago), intraductal papilloma status-post breast lumpectomy (2 years ago). The patient underwent chest/abdomen computed tomography scan revealing multiple lesions in liver and lungs with suspicion for metastatic cancer of unknown primary. Endoscopy revealed a mass lesion in the small intestine. The liver biopsy and concurrent small intestinal biopsy showed high-grade tumor with epithelioid cell morphology. (Figure 1A and 1B) with marked nuclear pleomorphism and high mitotic activity (approximately 5 mitotic figures per 10 high power fields). The tumor was immunoreactive for vimentin, CD31 (Figure 1C) and ERG (Figure 1D), while negative for melanoma (S-100, HMB45, SOX-10, Melan-A) and neuroendocrine (synaptophysin, chromogranin) markers. The diagnosis of high-grade angiosarcoma with epithelioid cell type was rendered. As per oncologist request, testing for BRAF V600E mutation was performed by immunohistochemical (IHC) stain on liver biopsy tissue and followed by next-generation sequencing using 50- gene panel (including BRAF). After being managed for angiosarcoma, unfortunately, the patient also developed large cell neuroendocrine carcinoma (grade 3) and underwent left lung lobectomy. 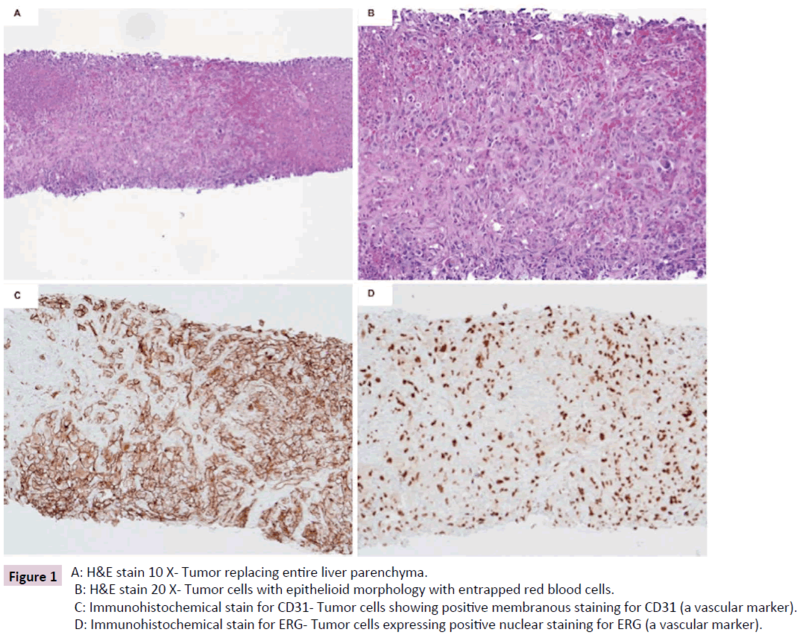 Figure 1: A: H&E stain 10 X- Tumor replacing entire liver parenchyma. B: H&E stain 20 X- Tumor cells with epithelioid morphology with entrapped red blood cells. C: Immunohistochemical stain for CD31- Tumor cells staining (membranous) positive for CD31 (a vascular marker). D: Immunohistochemical stain for ERG- Tumor cells expressing positive nuclear staining for ERG (a vascular marker). We retrospectively identified five more cases of metastatic angiosarcoma to the liver (excluding index patient) in the departmental database from the year 2006 to 2015. The slides were retrieved and reviewed by two independent pathologists. Taking all the cases in the account (including index patient), the male: female ratio was 1:5; and age ranged from 35-88 years. All tumors were classified as high-grade except one case, which was low-grade. Four of six were epithelioid types and two were mixed epithelioid and spindle cell types. The diagnosis was confirmed by a panel of IHC stains comprising of mesenchymal and vascular markers which included vimentin, factor VIII, ERG, CD31 and/or CD34. Institutional review board approval was obtained for the study. Paraffin-embedded tissue was cut into 4-micron-thick sections, and IHC for BRAF V600E mutation was performed using mouse anti-human BRAF (V600E) clone VE (Spring Biosciences, California, dilution 1:75) by Ventana Discovery XT stainer. The stain result was defined as negative (no stain) or positive (cytoplasmic staining pattern). For the case with positive BRAF V600E IHC, DNA was extracted from the specimen and examined by next-generation sequencing for specific mutations in 50 genes: ABL1, AKT1, ALK, APC, ATM, BRAF, CDH1, CDKN2A, CSF1R, CTNNB1, EGFR, ERBB2, ERBB4, EZH2, FBXW7, FGFR1, FGFR2, FGFR3, FLT3, GNA11, GNAS, GNAQ, HNF1A, HRAS, IDH1, IDH2, JAK2, JAK3, KDR, KIT, KRAS, MET, MLH1, MPL, NOTCH1, NPM1, NRAS, PDGFRA, PIK3CA, PTEN, PTPN11, RB1, RET, SMAD4, SMARCB1, SMO, SRC, STK11, TP53, and VHL. A detailed list of all the regions covered by the test is available upon request. The specific mutations are detected by amplification of the corresponding exons by polymerase chain reaction (PCR). The PCR product is sequenced on an Ion Torrent PGM instrument (Thermo Fisher Scientific, MA, USA). Total 6 cases of metastatic angiosarcoma in the liver were examined. Table 1 summarizes the histology and the status of BRAF V600E in these cases. Only one case (index patient) showed positive IHC stain for BRAF V600E (c.1799T>A) mutation (Figure 2) and was subsequently confirmed by the target gene sequencing. The variants of unknown significance were noted. The following regions showed coverage of less than 500X and are therefore interpreted as indeterminate: PIK3CA exon 2, PIK3CA exon 8, NPM1 exon 11, PTEN exon 3, ATM exon 9, ATM exon 54, RB1 exon 6, RB1 exon 10, RB1 exon 21, SMAD4 exon 4, STK11 exon 4, and GNAS exon 14. After detection of BRAF mutation, the patient received Vemurafenib, a BRAF inhibitor, for treatment. She responded well as measured by both imaging study and clinical outcome. All other five cases showed no BRAF mutation by IHC stain (Table 1). Figure 2: Immunohistochemical stain for BRAF V600E, 20X: Tumor cells mutated for BRAF V600E showing cytoplasmic staining. Table 1: Total 6 cases of metastatic angiosarcoma in the liver were examined. Angiosarcoma is a deadly disease with a dismal prognosis. Various therapies have been used for treating metastatic or unresectable angiosarcoma including chemotherapy (paclitaxel),  angiogenesis blockers  and multikinase inhibitor like Sorafenib  but the therapeutic response is quite variable. In this study, we identify a patient with metastatic angiosarcoma in the liver that harbored a BRAF V600E mutation confirmed by IHC study and gene sequencing and showed a great response to treatment with Vemurafenib, an inhibitor to BRAF V600E. The therapeutic strategy of angiosarcoma has heavily relied on our understanding of the genetics of angiosarcoma. The alterations of genes involving angiogenesis, mutation of p53 and the PIK3CA/AKT/mTOR pathway [9,10] and TGF-β signaling  are observed in subsets of angiosarcoma. BRAF V600E mutation, a molecular target in metastatic melanoma, colorectal carcinoma, and non-small cell carcinoma of the lung, has not been reported in angiosarcoma [9,12]. However, heterogeneous molecular alterations in angiosarcoma and relatively small samples in these studies do not null the possibility of BRAF mutation in this fatal cancer. Our study demonstrates a positive case of BRAF V600 E mutation, suggesting that there may be a small subset of angiosarcoma patients who may be eligible for anti-BRAF therapy using Vemurafenib. Vemurafenib was approved by FDA for the treatment of late-stage melanoma with BRAF V600E mutation in 2011 . It is an oral serine– threonine kinase inhibitor which acts by inhibiting only the active form of the kinase and acts as a selective BRAF inhibitor [13,15]. It blocks downstream processes by blocking ERK phosphorylation in BRAF mutant cells leading to inhibition of tumor growth and triggers apoptosis [13,14]. It has shown to be effective for BRAF mutant melanoma  and colorectal cancer . It also inhibits fluoro- deoxy-glucose uptake in BRAF mutant cells which can be monitored by PET imaging and can act as a marker for assessing metabolic activity of cancer cells . Sorafenib is a multikinase inhibitor which acts via multiple pathways through RAF serine/threonine kinases, vascular endothelial growth factor receptor tyrosine kinases; VEGFR-1, VEGFR-2, VEGFR-3 and platelet-derived growth factor receptor -PDGFR-β . It has shown to be effective in various tumors including hepatocellular cancer  renal cell cancer  melanoma, and malignant peripheral nerve sheath tumor . Phase II studies have shown the antitumor effect of Sorafenib in angiosarcoma [8,22] although Sorafenib does not directly block the V600E mutated oncogenic BRAF. In one of the studies, Maki et al. demonstrated activity of Sorafenib against angiosarcoma with 4 patients showing partial response and 1 patient showing complete response . They also found that progression-free survival with Sorafenib treatment was better in chemotherapy naïve patients . Coquard et al. also did a phase II trial study of Sorafenib in 41 patients with angiosarcoma. In their study progression- free rate was 3.8 % at 9 months in patients with superficial angiosarcoma while 0% in patients with bone/visceral tumors . Majority of the patients in this study had received prior chemotherapy, doxorubicin-based treatment or paclitaxel. Interestingly in this study, they found that Sorafenib was active only in the patients who had received prior chemotherapy in contrary to Maki et al. [8,22]. The advantage of Vemurafenib over Sorafenib is that it has fewer side effects, as it is a selective inhibitor. Toxicities such as arthralgia, rash, photosensitivity, fatigue, and alopecia have been reported with Vemurafenib. Cutaneous squamous cell carcinoma (mainly keratoacanthoma type) is a major complication of the treatment [13,23]. Vemurafenib can have a paradoxical effect by causing activation of the RAF/MEK/ERK pathway in some wild-type BRAF cells by stimulating ERK phosphorylation which may account for the development of keratinocyte proliferation [13,14,23]. In conclusion, our study shows for the first time that a subset of angiosarcoma may harbor BRAF mutation, and is responsive to BRAF inhibitor, Vemurafenib. The finding provides a new therapeutic approach for this deadly disease. However, our study was limited by small sample size. More studies are required to demonstrate clinical validity and effect of BRAF inhibitors in the management of patients with angiosarcoma. Murali R, Chandramohan R, Möller I (2015) Targeted massively parallel sequencing of angiosarcomas reveals frequent activation of the mitogen activated protein kinase pathway. Oncotarget 6: 36041-36052. Pearson G, Robinson F, Beers Gibson T (2001) Mitogen-activated protein (MAP) kinase pathways: regulation and physiological function. Endocr Rev 22: 153-183. Ascierto PA, Kirkwood JM, Grob JJ (2012) The role of BRAF V600 mutation in melanoma. J Transl Med 10: 85. Davies H, Bignell GR, Cox C (2002) Mutations in the BRAF gene in human cancer. Nature. 417: 949-954. Garnett MJ, Marais R (2004) Guilty as charged: B-RAF is a human oncogene. Cancer Cell 6: 313-319. Penel N, Bui BN, Bay JO (2008) Phase II Trial of Weekly Paclitaxel for Unresectable Angiosarcoma: The ANGIOTAX Study. J Clin Oncol 26: 5269-5274. Agulnik M, Yarber JL, Okuno SH (2013) An open-label, multicenter, phase II study of bevacizumab for the treatment of angiosarcoma and epithelioid hemangioendotheliomas. Ann Oncol 24: 257-263. Ray-Coquard, Italiano A, Bompas E (2012) Sorafenib for Patients with Advanced Angiosarcoma: A Phase II Trial from the French Sarcoma Group (GSF/GETO). Oncologist 17: 260-266. Italiano A, Chen CL, Thomas R (2012) Alterations of the p53 and PIK3CA/AKT/mTOR pathways in angiosarcomas: a pattern distinct from other sarcomas with complex genomics. Cancer 118: 5878-5887. Movva S, Wen W, Chen W (2015) Multi-platform profiling of over 2000 sarcomas: Identification of biomarkers and novel therapeutic targets. Oncotarget 6: 12234-12247. Verbeke SL, Bertoni F, Bacchini P (2013) Active TGF-β signaling and decreased expression of PTEN separates angiosarcoma of bone from its soft tissue counterpart. Mod Pathol 26: 1211-1221. 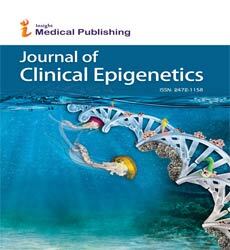 Je EM, An CH, Yoo NJ, Lee SH (2012) Mutational analysis of PIK3CA, JAK2, BRAF, FOXL2, IDH1, AKT1 and EZH2 oncogenes in sarcomas. APMIS 120: 635-639. Bollag G, Tsai J, Zhang J (2012) Vemurafenib: the first drug approved for BRAF-mutant cancer. Nat Rev Drug Discov 11: 873-886. Bollag G, Hirth P, Tsai J (2010) Clinical efficacy of a RAF inhibitor needs broad target blockade in BRAF-mutant melanoma. Nature 467: 596-599. Tsai J, Lee JT, Wang W (2008) Discovery of a selective inhibitor of oncogenic B-Raf kinase with potent antimelanoma activity. Proc Natl Acad Sci USA 105: 3041-3046. Chapman PB, Hauschild A, Robert C (2011) BRIM-3 Study Group. Improved survival with vemurafenib in melanoma with BRAF V600E mutation. N Engl J Med 364: 2507-2516. Yang H, Higgins B, Kolinsky K (2012) Antitumor Activity of BRAF Inhibitor Vemurafenib in Preclinical Models of BRAF-Mutant Colorectal Cancer. Cancer Res 72: 779-789. Ibrahim N, Yu Y, Walsh WR, Yang JL (2012) Molecular targeted therapies for cancer: Sorafenib mono- therapy and its combination with other therapies (Review). Oncol Rep 27: 1303-1311. Liu L, Cao Y, Chen C (2006) Sorafenib blocks the RAF/MEK/ ERK pathway, inhibits tumor angiogenesis, and induces tumor cell apoptosis in hepatocellular carcinoma model PLC/PRF/5. Cancer Res 66: 11851-11858. Chang YS, Adnane J, Trail PA (2007) Sorafenib (BAY 43-9006) inhibits tumor growth and vascularization and induces tumor apoptosis and hypoxia in RCC xenograft models. Cancer Chemother Pharmacol 59: 561-574. Ambrosini G, Cheema HS, Seelman S (2008) Sorafenib Inhibits Growth and MAPK Signaling in Malignant Peripheral Nerve Sheath Cells. Mol Cancer Ther 7: 890-896. Maki RG, D’Adamo DR, Keohan ML (2009) Phase II Study of Sorafenib in Patients With Metastatic or Recurrent Sarcomas. J Clin Oncol 27: 3133-3140. Luke JJ, Hodi FS (2012) Vemurafenib and BRAF inhibition: a new class of treatment for metastatic melanoma. Clin Cancer Res 18: 9-14.